A bright, extended Edwardian end-terraced family house with well thought out layout. The house has good width and generous ceiling heights. It features many clever design touches and offers great flowing family space on the ground floor leading out to a maintenance free patio garden, via a well equipped eat-in kitchen. There is good storage, coat cupboard and useful cloakroom off the entrance hall. The en suite bedroom in the converted attic is wonderfully light and along with the first floor main bedroom offers a choice of master suite. Situated quietly towards the northern end of Davis Road running parallel with St Elmo Road, the house is conveniently close to the thriving Askew Road, a few minutes walk from Wendell Park and within the catchment of Southfields Primary School. The shopping and transport hubs of Hammersmith and Westfield are within easy reach; the 607 bus route east along Uxbridge Road provides the fastest access to the Central Line tube. Stamford Brook or Turnham Green Terrace tubes are an approximate 15 minute walk. 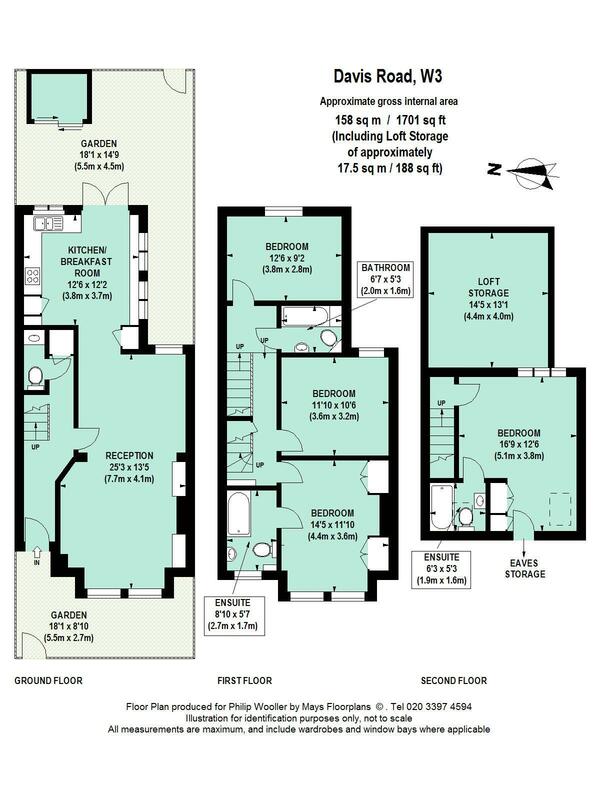 1701 sq ft / 158 sq m approx.